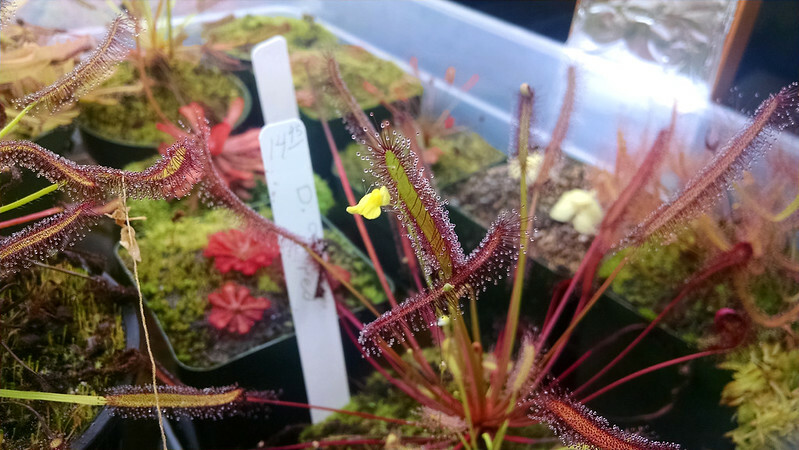 A few new blooms |Sundews Etc. 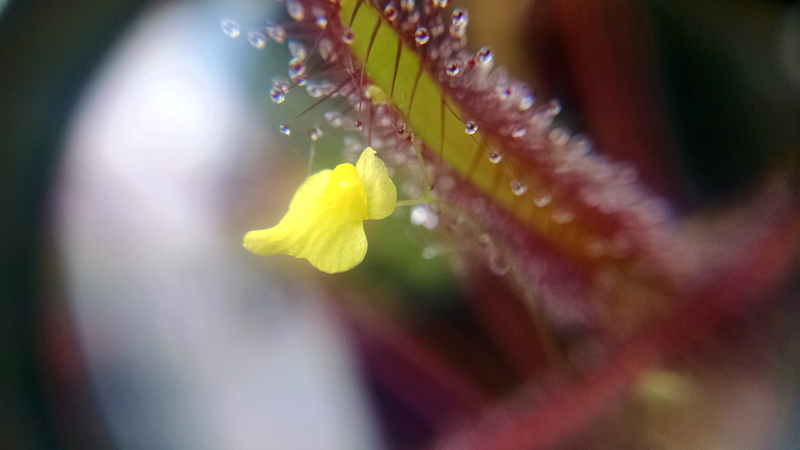 A couple days ago I noticed a little patch of yellow over in my Drosera capensis red form pot. It's like a whole ecosystem in this tray. It's Utricularia subulata! And this time with a proper flower, rather than the cleistogamous ones I've seen around my collection in the past. I love looking at my plants up close. These are nice, colorful flowers, and they'd be very pleasing in a dedicated pot, I think. I feel conflicted about the weedy Utrics – I do like to see them, but I don't really want them in every pot in my collection. 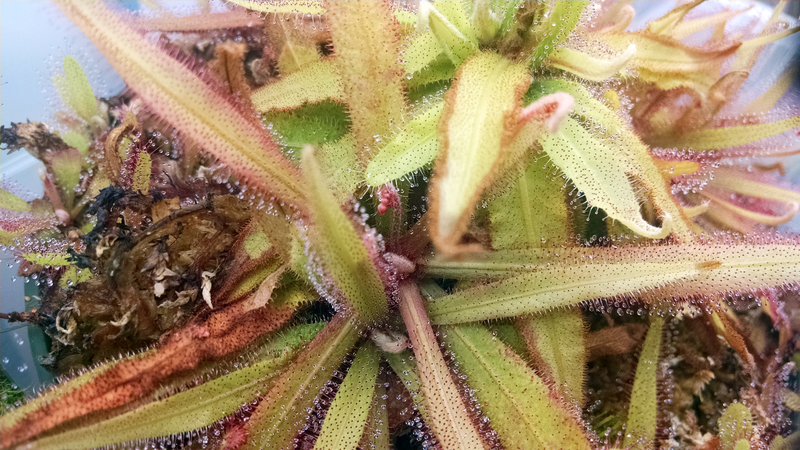 I also noticed a little something forming in my Drosera adelae bush. Looking forward to seeing the unique red flowers of D. adelae soon. Aww yeah, it's a flower stalk. This is exciting, since it's my first on D. adelae. I think I've heard before that this species likes to wait until the pot is sufficiently large and sufficiently full of plants to bloom. I guess I know what that looks like now. More photos as events warrant! 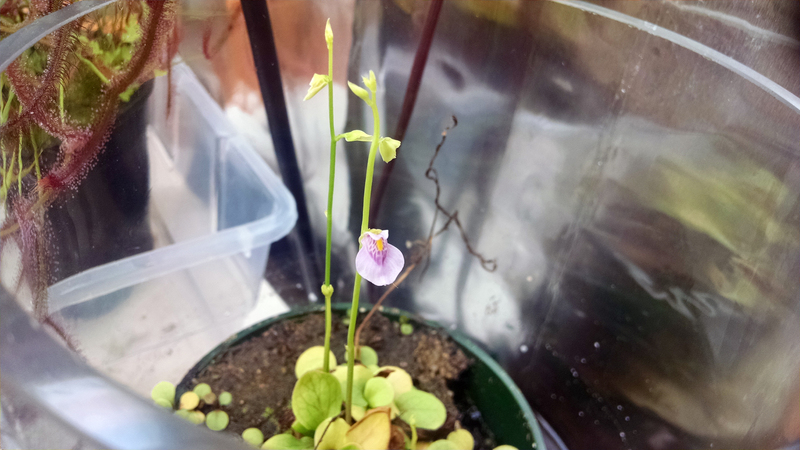 The coolest thing I noticed today was that the Utricularia calycifida flower that has been developing for a while has finally popped, and it's a looker. U. calycifida is an awesome plant. What lovely flowers. This is great! And there are several more flowers on the way. This pot is going to look fabulous by the winter BACPS meeting. Is that U. calycifida "Asenath Waite"? It's very pretty! Thanks! It didn't come with a cultivar ID (I just received it as U. calycifida), though it does look a bit like 'Asenath Waite'. Since there's no positive ID I don't like to assume cultivar status. It's just pretty!